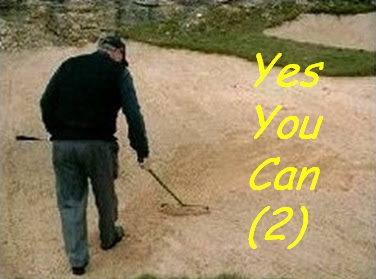 Rake irregularities in a bunker before you play your ball out of that bunker, provided this is for the sole purpose of caring for the course and nothing is done to breach Rule 13-2 with respect to your next stroke. Exception 2 to Rule 13-4. Carry a left-handed club, even if you usually play right-handed. Nothing in the Rules disallows this. Borrow balls, tees, gloves, towels etc. from another player during a round (in fact, you may borrow any equipment except a club). Decision 5-1/5. Have more than one caddie during a round, provided that you only have one caddie at any time. Decision 6-4/7. Enter the clubhouse, car park or pro shop during a round without penalty, providing you do not unduly delay play. Decision 6-8a/2.7. Knock down tree leaves with a practice swing, providing you do not actually improve the area of your intended swing. Decision 13-2/0.5. Test the condition of a bunker, providing your ball does not lie in or touch that bunker, or a similar bunker. Rule 13-4. Roll a ball over the putting green to a fellow competitor or opponent, providing you are not doing so to test the surface. Decision 16-1d/1. Remove a flagstick, or the equipment of any player, that has been left lying near to the hole if you think that any ball in motion might hit it. Rule 24-1. Whilst I do not subscribe to all the comments on this slide show (27 slides), especially the final slide, which purports to give the reason why a round of golf is over 18 holes, I do support the message behind it. For me, the most important point that it illustrates is how lucky we are to engage in a sport that is played at such wonderful places. I recommend that you spend a couple of minutes checking out this link. For the real reason why a round of golf is over 18 holes check out this more authoritative link. Every golfer who would like to obtain a better understanding of the Rules should start by purchasing this eBook, ‘999 Updated Questions on the Rules of Golf 2012-2015’ - Only $9.99. Barry - I am relatively new golfer and am trying to improve my Rules knowledge. Could you please tell me when a ball is deemed to be in a bunker / hazard? Is it when any part of the ball touches the bunker / hazard or is it when all of the ball is within the bunker / hazard? ... a bunker, it is in the bunker.